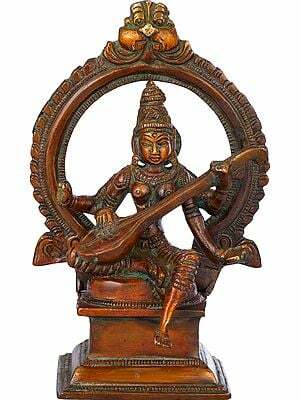 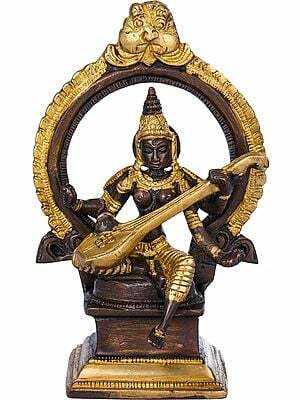 Of all the Sarasvati murties that have been made in India, this superbly elegant cocoa-finish sculpture is a rare example of Her iconography. 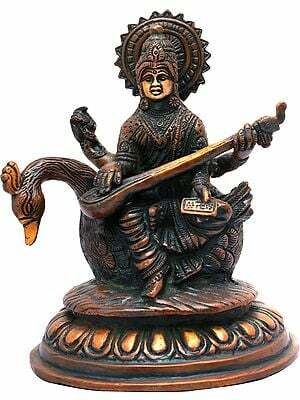 She is widely revered as the Devi of learning and the arts, venerated especially by students, lovers of books, and performing artistes across the subcontinent. 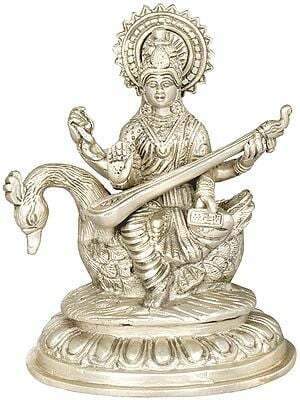 Wife to Brahma Himself who is responsible for creation of the world, the knowledge that She presides over is a prerequisite to the process He presides over. 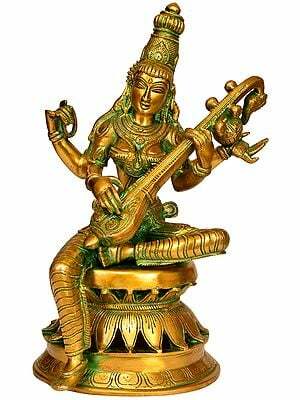 She is never idolised without the musical instrument of Her choice, the veena that She strums on to produce divine music. 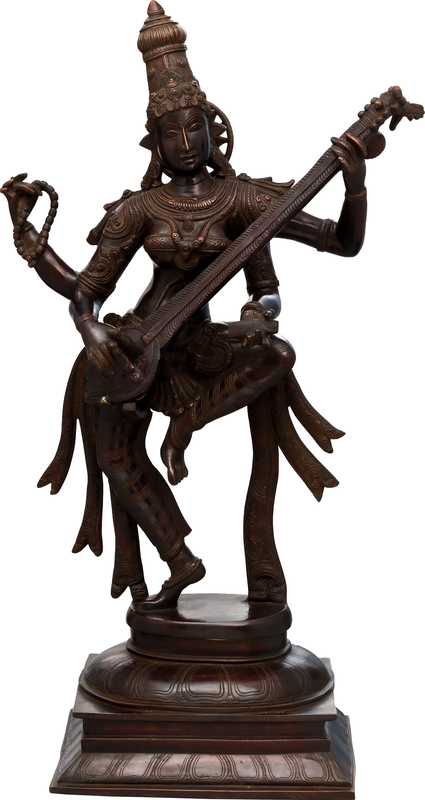 In this unusual sculpture of the Devi, She is portrayed in the midst of a complex dance routine - a knee is bent with the ankle raised midway through the length of the other leg, which is in turn balanced on the toes. 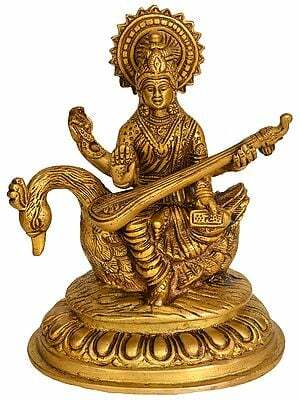 Made from the popular medium of brass but with features as beauteous as if they were sculpted from bronze, the rest of the Sarasvati iconography is intact. 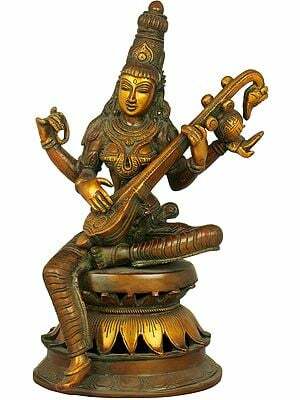 She has the lithe form of a classical dancer, Her limbs bent in the most gracious of natya motions. 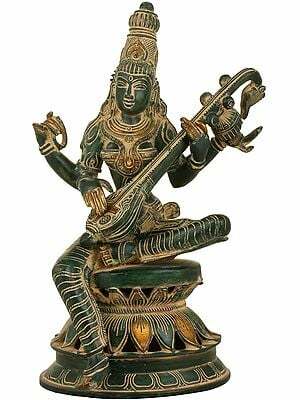 An ornate crown as tall and slender as She is rests on Her brow. A dhoti of super-fine silk is draped navel downwards, while Her torso as well as arms and ankles are laden with layers of shringar fit for a heavenly deity. 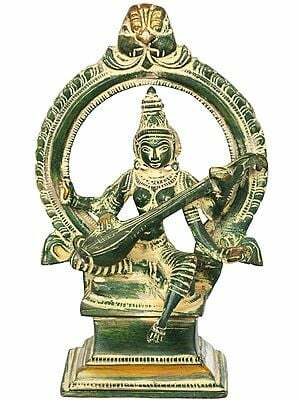 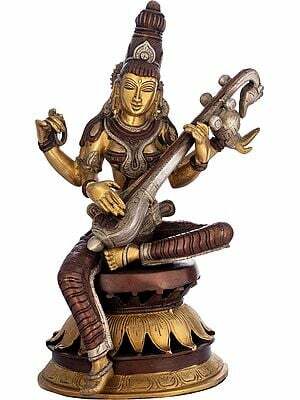 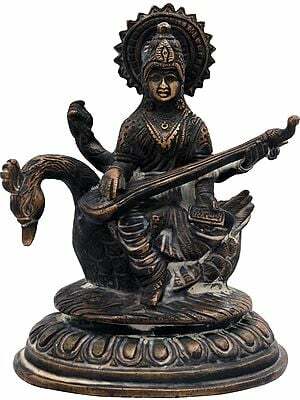 Apart from the veena in Her anterior hands, She holds a pothi and a rosary in the posterior hands. The sashes emerging from Her lotus-petalled halo spread about Her shoulders, while the ones descending from Her waist add balance to the composition. 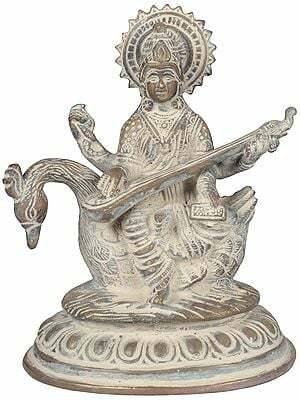 She is placed on a pedestal that has four layers featuring lotus petal engravings (alternate layers) and pistil-shaped carving (the topmost).